One of the biggest exposures of toxic levels of mercury is from vaccinations. Mercury is also evaporated in the atmosphere. Inorganic mercury is methylated in the marine environment by microorganisms and then accumulates in fat deposits of fish. Mercury is used in the manufacture of thermometers, manometers, electric equipment, fluorescent light bulbs, pharmaceuticals and pesticides. Used in amalgam for dental filling. Acute exposure to mercury by inhalation includes chemical pneumonitis and pulmonary edema. Ingestion of organic compounds of mercury can cause gastro-intestinal irritation, vomiting, bloody diarrhea and stomach pains. Dermal exposure of mercury can cause contact dermatitis. Mercury toxicity and central nervous system effects include erethism, restlessness, insomnia, difficulty concentrating and memory deficits and intention tremor and gingivitis. Mercury also effects the kidneys and renal function. In children mercury toxicity can result in pink disease which is a reddish scaly skin eruption. Methyl mercury toxicity causes paraesthesias, ataxias, visual field defects and deafness. Congenital exposure of mercury may lead to cerebral palsy. The chemical form of mercury – inhalation of vapor is worse than inorganic which may be worse than organic. Pregnant women can pass the mercury in their bodies to their babies and through breast milk. Mercury (and aluminum) is injected into millions of infants and children yearly, causing significant heavy metal toxicity and while those children’s immune systems or at their weakest. Russia banned thimerosal from children’s vaccines in 1980. Toxic mercury vapor is continually being released from amalgam fillings where 80% of it enters the body and accumulates in it. 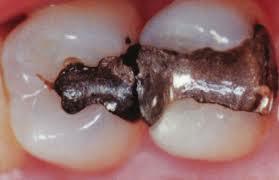 Be sure to watch the video of the “Smoking Tooth” when you are there to see mercury vapor from a filling. Mercury is present in contact lens solutions, cosmetics and drugs and other biological products as thimerosol. These terms in cosmetics mean it contains mercury – read your labels!